How to tell when your roof is in need of repair is not as unnerving as it may seem. Often times, going on appearance alone is enough to let you know that your home may be in need of a roof repair. Bad weather can even be an indication and a cue to check on your roof. However, taking steps to provide proper repair and maintenance throughout the lifetime of your roof will help to ensure it lasts. Most residential roofing, depending on the material chosen, should last twenty to thirty years. 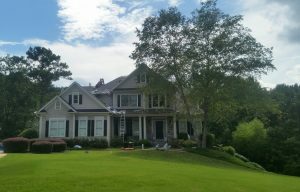 Below we outline some of the things you should be on the lookout for when deciding if you are in need of some roof repair. Curling shingles are probably one the easiest signs to notice. Roofing speaks to you and if you listen, you’ll hear exactly what is going on. One of the more common signs of needing roof repair is curling shingles. Your roof shingles should always be lying flat to create a proper roof barrier. The cause of the curl may take a little more figuring out, as there are a number of potential causes. When laying a roof, it’s our job to make sure that the new roof is done correctly. When a roof shingle curls, one of the reasons could be that the original roofer didn’t use enough nails per shingle. When there are not enough nails used to keep that shingle flat, the edges will start to turn up over time. This ties in with a proper tar line adhesion as well. During installation, this adhesive line of tar is essential in keeping your shingles in place. If the shingles are not lined up correctly, your shingles will curl. When shingles are curled, they are susceptible to rain, snow, and even wind damage. One more note on the installation side of things. Roof shingles are prone to curling especially when you have multiple layers. While this may save cost in the beginning by not tearing off your old residential roof, adding multi-layers is not conducive to a long and healthy roof life. One, or a combination of all of these things, can cause your shingles to curl up over time. Once you notice this happening, it is definitely time for an inspection and roof repair. This one can be pretty easy to detect as well. When your roof experiences granule loss, you’ll notice that the tiles will start to have a sort of bald look to them. From down on the ground, they may appear darker in color than the typical look of your roof. One of the things that can cause this are badly placed downspouts. Think of it as erosion. If you have a lot of water continuously running over a section of your roof, that water will eventually wash away the protective granules on an asphalt tiled roof. While granule loss is to be expected over time, a poorly placed downspout is something that may be a culprit and put you in need of a repair sooner than you expected. Another issue that may cause roof shingle baldness is rough weather. A nasty bout of hail can be enough to take granules right off of a residential roof. When you’ve had bad weather roll through, it is always a good idea to inspect your roof for any possible signs of damage. The longer you wait on a bald tile, the more susceptible you are to more expensive issues, including roof leakages into your home. Flashing is a very, very important part of a residential roof. If it is installed correctly, it ensures outside elements don’t come into your home. It is installed over the joints in your roof and usually made out of a rust-resistant material like galvanized steel or aluminum, sometimes even copper. You will typically find flashing around the chimney, skylights, valleys where two roofs meet, etc. Think of it as a big, flat, metal shingle. It’s even used around your windows. It protects your home where a regular roofing shingle cannot. When flashing on a residential roof is damaged, you could be in for a world of problems. Mainly – water damage. It will seep up, under, and around the flashing and into your home, causing far more damage than you were prepared for. Flashing damage can be simple to spot as well. Old and damaged flashing may rust if a rust-resistant material was not used. If you live in an area with extreme weather conditions or changes, roof flashing may warp and bend from the temperature fluctuation. Flashing can even move from a home settling over time. The hardest impact on flashing is the winter months. When snow or ice piles up, it can wear down the area around the flashing, causing water damage. Other things to look for are holes, cracks, missing pieces, even internal leaks. If you notice any of these issues with your flashing, it may be time for a roof repair. While the age of a roof does have an impact on its appearance, these are all items that you shouldn’t be seeing for a long while when you’ve had a proper residential roof installed on your home. There are steps you can take to extend the life of your roof through the years. Before initial installation, make sure your home is well insulated and your attic is ventilated. Clean your gutters annually, or more so if you live in a wooded area. If debris starts to accumulate, clear off your roof. Additionally, have your roof looked at every couple of years. While the items listed above may be easy to spot, regular cleaning and inspections can save you from a long list of roof repairs down the road. A roof is one of the most important investments you can make for your home. Keeping it in tip-top shape only guarantees your home will last through the years. For more information on residential roofing, visit our site here.